Many of our native plants put on their second show of growth and color in the fall, making this the perfect time to head out into your garden to gather flowers, branches and fall colored leaves to put in a vase for a flower arrangement or for materials to make a wreath. Designing wreaths with plants right out of your garden can be fun and easy if you follow a few basic steps. Harvest cut flowers anytime. Harvest herbs in the morning after the dew has evaporated but before the day warms for more fragrant essential oils in the plant material. 1. Start with fresh cuttings of foliage and flowers straight from your garden (fresh material is more flexible, better smelling and stays fresh looking longer than dried). Prepare an area for assembling your wreath by placing a plastic tablecloth over a large table, preferably outside under a large tree on a beautiful fall day! 2. Cut the stems/flowers about the same length; 8 to 12 inches long depending on the size of the ring. A larger frame needs longer stems and more material. 3. 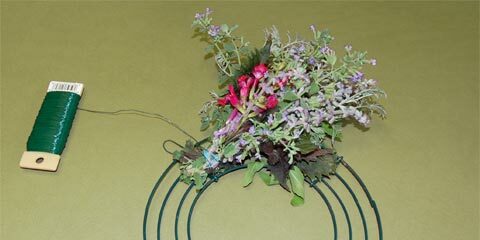 Assemble your foliage and flowers into 10-12 groups per ring (depending on the size of the ring). Ensure clusters are same length, and wrap a rubber band tightly around the end of the stems to secure each bundle. 4. Securely wrap the end of the spooled wire around the wreath ring to form a hook. Do not cut the wire, as you will be using the wire in the next steps to wrap the foliage tightly around the form. 5. Place your first bundle of materials on the wreath ring. Tightly wrap the wire several times around the wreath to secure it to the ring. 6. 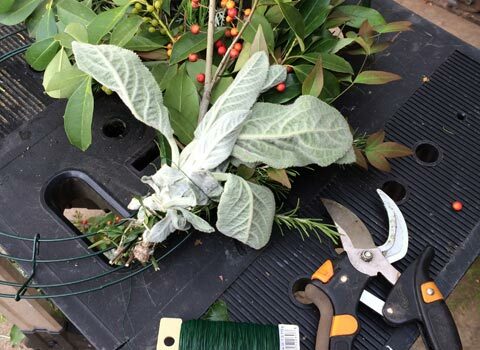 Place a second bundle of materials securely on the wreath form and overlapping the stems of the first bundle. Position the bundle with stems aligned with the previous bundle and following the curve of the ring. Continue wrapping with wire. 7. 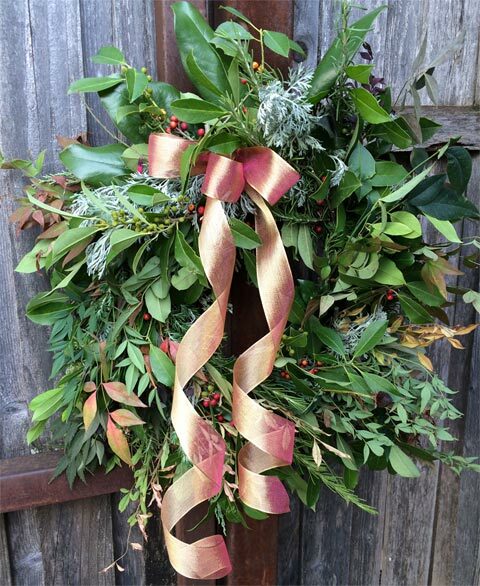 Continue adding bundles of foliage until the whole wreath is covered, wrapping the wire around the wreath to secure the materials to the ring. 8. Once you’ve reached the starting point and are attaching your last bundle of materials, carefully lift the first bundle and tuck the stems underneath. Holding the first bundle up and out of the way, tightly wrap the wire around the stems of the last bundle to secure it one last time. Adjust the bundles to hide the wire frame. 9. Now you can cut the wire, leaving 1 or 2 inches to wrap around the wreath form tightly, pushing the sharp end into the wreath. 10. For a finishing touch, add any special decorations such as bows, ornamental sprigs, roses or fruit. 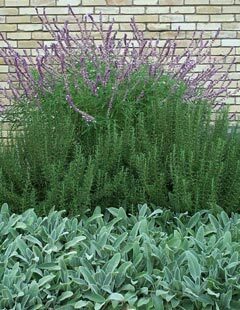 My favorite wreath materials are fresh from the garden in the fall: silvery Artemisia ‘Powis Castle’, purple Mexican Bush Sage, and culinary herbs like rosemary, thyme, sage and lavender. For a more traditional fall arrangement, warm colored plants in shades of red, orange and yellow are bountiful this time of year. Look for oak and maidenhair trees and berries of other native plants – Snail seed vine, Yaupon Hollies, Oakleaf hydrangea, and flowers such as marigolds, mums, and Texas tarragon. Add embellishments such as dried seed pods of okra, magnolias, or other remnants of summer bloomers. For the Holidays, use trimmings from pine trees, junipers, rosemaries, and hollies and celosia for a pop of color. 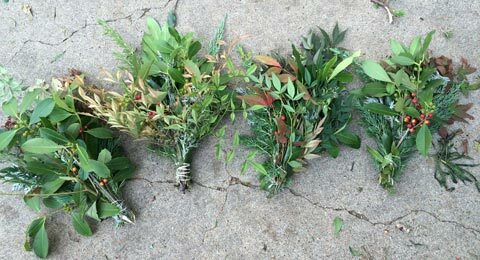 For more on seasonal color for wreath making and other crafts, check out my post on herbal holiday crafting.